My last post concluded with me posting a short video of my game to be considered for the Abertay showreel compilation. When I posted it I was having massive problems with format types and size limitations, which led to a below average the video quality. Because of this I was pretty convinced my submission would be completely rejected. However I was surprised and flattered to see that my clip was one of the first to be shown in the video. I am still unsure as to whether or not I wish to continue working on Last Solus in the future, but for the time being this will be the final playthrough video. While it's far from being a great game, I feel for a solo student project I did not too bad. If I'm being honest I don't feel I pushed myself the way I should of for the dissertation. I was so caught up with my project my dissertation was often neglected. I do believe it sometimes manages to accurately explore atmosphere in horror games in interesting ways, but for the most part it falls flat, which is a shame. Anyway, I will let you be the judge. 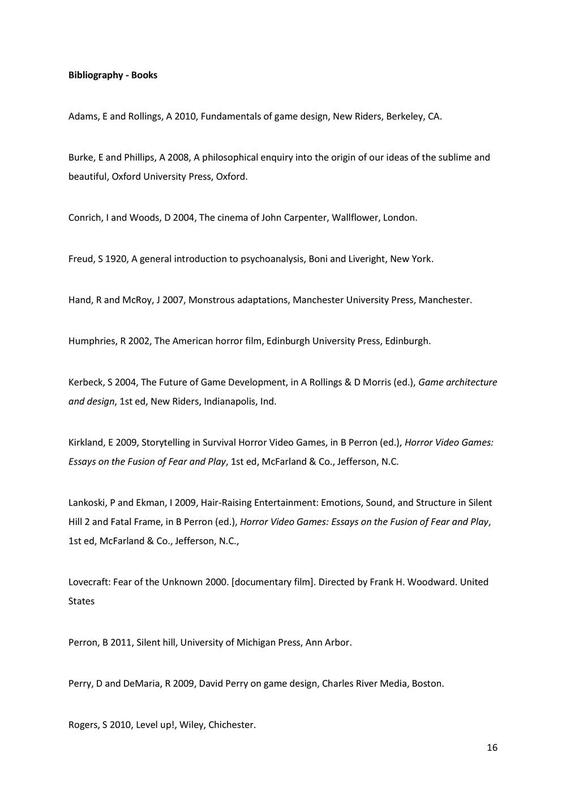 A PDF of my dissertation can be found here. or the showcase I had to create several posters to convey the theme, tone and purpose of my game. Despite some issues with the file format and printing I'm happy with how they turned out. After hand-ins where finished I had the task of showcasing my game for four days at the Hannah Maclure Centre. This was my first experience presenting my work to the public and at first I found the whole experience quite overwhelming but I quickly managed to adjust and ended up really enjoying it. On the first day of the showcase I was awarded the Design in Action Prize for Commercial Potential. The prize is awarded to a student "who produces a well thought-through project from a commercial viewpoint in terms of polish, direction and brand". I wasn't expecting any sort of award so this came to a massive surprised and I was truly honoured. After receiving the award, Design in Action invited me to showcase my project at their Design Summit event in Edinburgh. I was pretty ill at the time so didn't manage to make the most of the showcase but it was great to meet and talk to some of the other exhibitors and previous Commercial Potential Award winners. Finally graduation! It's been a long and occasionally tough year but I can honestly say I had a fantastic time throughout. My time at Abertay has led to some the most interesting and rewarding years of my life. From lecturers, to friends, to flatmates, I’ve met some amazing people and I can’t wait to see what comes next. I just wanted to say thanks to everyone who took the time to check out this blog over the past year or so, seeing the view count go up often kept me motivated to keep working when I was otherwise burnt out. If you have any questions about my work or course feel free to message me and I’ll be sure to get back to you. Back again for the weekly update! Things are going reasonably well, there's a lot to do but I feel like I'm on top of it for the most part. I've got the next 2 weeks off uni so I'll be visiting my parents which is always great as it means I focus solely on my uni work for a bit. Anyway, here's a rundown of what I've been working on this week. A couple of weeks ago my supervisor suggested that I temporarily switched focus from my honours project to my dissertation. I followed that advice for the most part so there hasn't been a great deal of progress with Last Solus but I've managed to add a few things. I finally created proper wall collision which took a bit longer than I expected due to all the curves but it's working petty well. I was originally using blocking volumes but I was having some issues with door areas so instead decided to go with BSP brushes with a transparent material. Below you can see what the collision looked like before the see-through texture was added. I've made some minor model changes such as re-texturing the boards that where blocking off the bathroom and adding some Celtic wall decals. Adding a Celtic theme was something I planned from the start and only just realized I had for the most part ignored. After adding a few references I'm not 100% convinced it's the best way to go but I'm definitely going to give it a try as I feel adding religious / ceremonial elements to the game could add quite a sinister presence to the lighthouse. It also fits in quite well with my dissertation research. I've also added a dust particle and candle flame particle effects which can be seen in the images below. When trying to create the candle flame I accidentally broke the lantern glass material but I'm hoping to fix that soon. New boards, dust particles and Celtic wall decal. I may have mentioned this before but my dad is poet who mainly writes in Scots. As I wanted to add an authentic Scottish vibe to my game and I really like enjoy reading work I asked him if he would be willing to write up a quick poem based around a possessed lighthouse, which I could then use as one of the notes scattered around my game. I told him about my current narrative and what themes / feelings I wanted to generate and he came back with this, which I really love. In deep despair, Ah cried a prayer, oan this earthly coil tae bide. Whaur torrents howl and demons growl, in endless anguished mock. Whaur blood stain fades oan rusted blades, fae those that brawled and sinned. Whaur piles o’ bones, an deid men’s groans, ma humble soul deprave. I really wanted to have the poem scratched into the wall to make it part of a bigger set piece but I just couldn't get it to look right so I had to move back to the paper note idea. I've made the model and texture but I'm just not too sure where exactly I want to place it yet or how I'm going to have the player interact with it. He's an image of the texture I made for it and what it currently looks like in the game. It's a bit hard to read due to the font but I feel like it makes it look more authentic. Dissertation wise I feel reasonably happy with where I am. I've just finished my 1st draft which I sent off to my supervisor yesterday. It only featured 1 case study as I felt like I was doing something wrong and didn't want to waste my time writing more if I would just have to redo them all again anyway. It's getting to the point where my dissertation is being held back by the slow progress in my honours project, but I hope to sort that out over the Easter holidays. I would post my first draft but I'm a bit embarrassed by its current state so shall leave it for the time being. So, it would seem like I'm not very good at this whole keeping a weekly blog thing! I've been incredibly busy over the past month and like I've said before, when time starts to run out these blog posts are usually the first thing to go. I naively thought I could balance honours with chilling and having a social life without any sort of schedule, but that has proven to be a massive mistake. Before week 6 I was on great role of productively but I messed up and as result my output over the past few weeks has been pretty poor. It would take me hours to type up all the things I've been working on over the past few weeks, so I'm just going to post a video showcasing where about I am now and I'll hopefully start posting any updates next week. The coming weeks are probably going to be even busier than the past month so there is a chance this blog will once again be forgotten, but I'm going try my best to remember as I genuinely miss writing up my progress as I find it to be quite a cathartic and useful experience. Just before I start, I've only just recovered from a pretty bad fever /flu thing so apologies if this post is more incoherent than usual. This week I spent the vast majority of my time learning and implementing Blueprints into my game. While I had a decent understanding of UDK's Kismet, Blueprints seems to be significantly different so little of my prior knowledge has carried over. Front door opening and closing. Single rain particle emitter following player when in certain areas to create the illusion of rain everywhere. Rain toggles visibility depending on whether the player is inside or out. Lantern attached to players camera, along with spotlight that moves according to players mouse inputs. It would take quite a while to write about each of these separately so I'll just talk about the most interesting which is probably the ladder. When designing the basement I assumed that ladders would either already be built into UE4's first person template or would at least be very easy to make, but I was completely wrong. It turns out ladders are far more complicated that I was expecting. I found and followed several different tutorials but eventually settled on a slightly modified version of this by Justin Plowman. The video also shows a new radio model which I created this week. I was reasonably happy with how it turned out, but I still wish I had more time so I could properly polish it. I also created some basic basement shelves this week, but I'm I'm still in two minds as to whether I should remodel them or not. The proportions are pretty true to the reference images I was working of, but in the game they seem far too big. While writing this post I realized that I hardly did any research or work for my dissertation this week which I'll need to make up for in my next post. I did however get feedback for my bullet point plan from last week which was incredibly helpful. Based on the feedback I feel I have a pretty decent contextual review, I just need to work a lot on the methodology / case study side of things. Refining current blueprints interactions / adding more. Since the Global Game Jam threw of my weekly schedule, I decided to combine weeks 3 and 4 into one post in an attempt to get back on track. In the last post I mentioned how my game was so poorly optimized that the university PCs struggled to even open it. I assumed this was because I had a lot of particle effect and massive textures, but even after removing them the game was still surprisingly demanding. In order to test how much of this was the engines fault I created an exe of the Unreal 4 FPS template. While my game was more demanding than the template, there wasn't much in it. This led me to the conclusion that very few if any of the university PCs will be able to run my game regardless. While it's bad news that I will most likely need to bring my own PC to the honours show, it's great to know I won't need to cut down a bunch of features just for optimization. As for modelling, I managed to start and finish the concrete base that the lighthouse sits on, as well as the railings and ladder attached to it. I was really disappointed with how it turned out, but it's going to be mostly covered by darkness so I'm not too worried. One of the benefits of having the base is that it gave me a very clear understanding of how much spare room I had to work with, and it didn't feel like nearly enough. Thankfully when originally designing the lighthouse I was very aware that this could be a problem, so had made an area that could easily be converted into a hatch that opened up into a basement. I feel it's probably a little bit too late to start adding more rooms to my environment but I think in the long run it will dramatically improve the quality of the game. Having all this extra space also allowed me to dedicate the whole shaft of the lighthouse purely to the spiral staircase. I had always felt the previous narrow (and easy to fall of) staircase was an incredibly big design flaw, so I was ecstatic to get rid of it. I've still not textured or even properly modelled the new stairs yet but I am already 100 times happier with them. I've also started designing some characters that will feature in my game. I've not finalized the story yet but due to my lack of animating and rigging skills, all the human models will either have to be motionless spirits or dead / decapitated bodies. It's pretty unsettling creating characters when I know they will most likely be cut into pieces and placed around the level for environmental storytelling, but I suppose in horror these sort of things come with the territory. While I would have loved to model the characters from scratch, due to time constraints and my lack of experience in that area, it's just not feasible. For this project I have decided to use the Fuse character creator which is a program that allows users to quickly and easily create the characters for games or animation. It's not perfect but it's more than enough for what I need. I started creating a character to try and get used to the editor, it still needs a lot of editing but I feel it's a good start. My current plan is to have 2 males and 1 female but this may change as the story develops. As for my dissertation, my supervisor suggested we send him a bullet point list for how we were planning to structure our work. I found this pretty tough, but I didn't get any negative feedback about how I structured my research proposal so I decided to follow a very similar pattern. The methods behind creating an unsettling atmosphere in horror games. Outlines main areas of dissertation. Justify research –atmosphere is a key component to horror games yet there is little research into how it is actually created. How this research will help designers understand and implement unsettling atmospheres to their games. State aims - explore the methods and techniques used to create atmosphere in horror games. State objectives – how I will achieve these aims. Can’t see what is right ahead of you, constantly expecting the worst. Ambient noises makes the environment feel alive and potentially malicious. How horror games often rely on startling player (jump scares) over actually creating an intimidating atmosphere. Devendra Varma on difference between terror and horror. How terror and horror must be balanced to create a great horror game. Minimalist storytelling to let audience fill in blanks. Sense of mystery makes player want to explore more and continue playing. Balance curiosity with unsettledness. Real life references, CDs, books etc. Methods of making player frustrated. While difficulty can create atmosphere, mechanics like checkpoints completely destroy any tension as player already knows what is going to happen. Explain how I defined the criteria for judging atmosphere by referencing the information gathered in the contextual review along with other research. Using the knowledge gained from the contextual review, case studies and further research I create my own horror game. Analyse my game following the same criteria as the case studies. Explain the theory / reasoning behind key games design decisions. Compare the case studies with my practise based research. Evaluate the effectiveness of my game’s design decisions and how they relate to theories covered in the contextual review. What went wrong/ didn't work? Was it a problem with the theory or the implementation? Analysis how well all the games manage to establish a well realized atmosphere. As you can probably see it's still very rough but for the most part I feel confident with the basic layout. Now I just need to wait for feedback. “There are two horror stories that we can tell, and we can imagine ourselves around the campfire listening to the tribal elder or witch doctor or preacher or whoever it is telling us these things at night. The first thing he tells us is about where ‘evil’ is, and he says, ‘Evil is out there,’ and he points beyond the campfire, to the darkness in the woods and the noises we hear at night; the wolves that come and drag us off; those beasts out there; the ‘other’ - the other tribe, the other people - the ones who are different, different color, their eyes are different from ours; those are the evil ones out there. In different countries they have different clothes, different ideologies, or they may be any force of nature we cannot control, so this unifies the tribe. Return to asset modelling and create some objects to fill in the new areas. 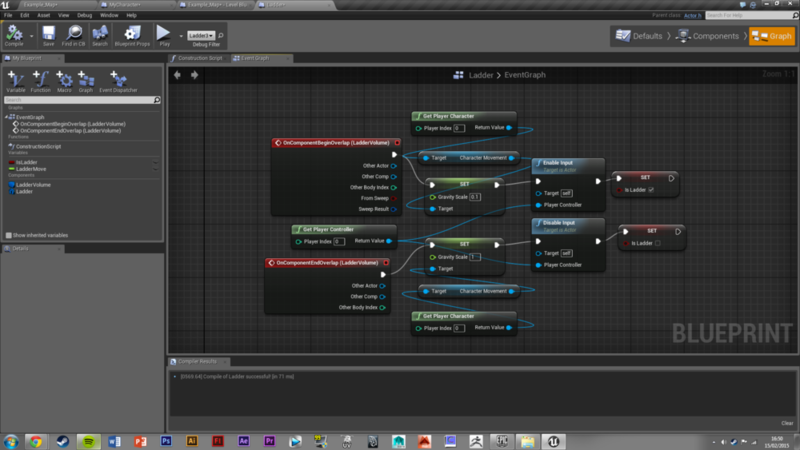 Learn how to add interactive elements to game using blueprints. Find and watch more horror documentaries. Well, my plan to post these every Friday night did not last very long. However, this week I do have a good excuse. From Friday to Sunday I participated in the Global Game Jam, which I will get into later. First I want to discuss the progress I made with my dissertation and honours project. I started of the week by creating more 3D assets that I can add to my game to make the environment look more cluttered and real. The photo is of my great grandfather, who was a tailor in the 1920s . There was no significance behind this, I just needed an old royalty free image and remembered I had this on my phone. I spent a decent bit of time with each model, yet was very disappointed with how they turned out, which is always a demotivating experience. I had been asset modelling for over a month by that point and it was starting to feel like I was just making 3D assets in a vacuum, with no real results or visible end to the project. In order to combat my disinterest in the project I decided to take a break from 3D modelling and try to work with the Unreal Engine 4. I hadn't touched the actual game file in several weeks so it was very out of date. I pretty much started from scratch and began importing all the old and new assets in the engine. Seeing all my work come together to create a reasonably okay scene was actually very inspiring and made the projects scope feel far smaller and doable. While it doesn't look like much, it took a significant amount of time to get everything imported and set up correctly. The stairs themselves look several hours just to line up correctly and I still think they need a lot of tweaking. I tried to bring this version of the game into uni to show my supervisor and group partner, but unfortunately the exe was too intensive for any of the PCs to even run. I'm pretty sure it's the rain particle effects which are causing the problems with performance, but I have yet to check properly. As I was unable to show the game in person to my supervisor I instead emailed him the video asking how I should proceed. His main advice was to just keep on making more assets that can be duplicated and reused to make a realistic cluttered environment, which I agree is probably a good idea. "Last reason for reading horror: it’s a rehearsal for death. It’s a way to get ready." "It's that anticipation, that's the thing that always kills you. You know, the things that I've learned, I guess, is that the things that you imagine is always much worse than anything they can show you"
As for next week, the plan is just to continue making more assets, import them into Unreal 4 and watch some more horror documentaries. I may also try and start watching some blueprints documentaries if I have any spare time. In the past week I celebrated my 21st, moved to Dundee and started back at uni so I haven't had the chance to work on stuff as much as I would of liked. I'm going to once again attempt to make these posts a weekly occasion instead of just posting whenever I have anything new. The plan is to post every Friday evening, starting with next week. I'm back to prop modelling as I still have a lot of objects left and they are relativity easy and fun to create. I'm becoming increasingly concerned with the polycount of the environment so I've been trying to limit the detail of objects but I'm finding it pretty difficult. I have no doubt Unreal Engine 4 will be able to cope, the problem is more that my game may not run smoothly on the university PCs. Recently I've been combining dissertation research with 3D modelling, which I've found to be incredibly helpful. While I'm modelling in Maya or texturing in photoshop I'll be listening to horror documentaries or podcasts in the background. "I'll tell you a secret: if you make the screen dark enough, the mind's eye will read anything into it they want! We're great ones for dark patches. ... The horror addicts will populate the darkness with more horrors than all the horror writers in Hollywood could think of." "There are two kinds of horror stories. In the first, the evil is out there in the dark; it’s the people that don’t look like us, the other. The second tells that evil is here; it’s in our own human hearts. We are the enemy. That’s a much harder story to tell." "Audiences don’t want something too horrible. That’s not entertaining for them. They want to be entertained. They want to have a good time. They don’t mind some of the characters on the screen getting bumped off, even in terrible ways, but you can cross a line, and the audience will turn against you. And if you’re a filmmaker, you can sometimes use that to your benefit by teasing the audience. The audience will say, ‘Are they going to show me something I don’t want to see? I’m getting nervous now… this director may show me something that’s really going to disturb me. If you can find that niche, it’s great because the audience then provides most of the action for you in their heads." I also had my first honours supervisor meeting this week, which was mainly just discussing research methodologies and rough time schedules. I forgot to take notes, but I will definitely be doing that next time as I have a terrible memory. We were told to focus solely on our honours projects for next week so I'm planning on just following the same formula of this week and 3D model while watching documentaries. While piecing the lighthouse together, the brown wood of the lighthouse doors started to look very out of place. In order to combat this a new door texture was created, this time in the same black and white style as the rest of the lighthouse. I feel the new door texture look far better than the previous attempts. Here are some closer shots of the new top of the lighthouse which was mentioned in the previous posts. I don't think the very top textures look very good but they will rarely, if ever be seen so that doesn't matter too much. I've spent the past 2 days working on the old lighthouse model. The top of the lighthouse has been completely remodelled, UV mapped and textured. While it has improved a lot since it's last renders it is still quite far away from being completed. I've been working on some more models over the past few days. It's mostly just props but I did manage to finally texture the window for the lighthouse. Some more models I've been working on in my spare time. I'm decently happy with how they have turned out but I struggled with making the blood splatter textures. I've added specular maps to the blood areas in an attempt to make the blood look fresh and wet but it still seems to look old and soaked in. I have no idea how to fix this. I've had a quick look online but haven't really found any solutions. Once I start back at uni I will ask around. After spending the last several weeks writing essays back to back I had completely forgotten how enjoyable I find modelling. As I had a spare couple of hours I decided to work on a bigger prop. Despite their simple geometry I always find desks quite hard to texture. I think since they are often so plain it's hard to make them look right. I wanted to keep the furniture in the lighthouse quite bare and old looking, yet I still wanted it to be visually interesting and I think i have achieved that. I was concerned that the blood stains, scratches and coffee mug stains might be a bit much but overall it seems to work. The biggest issue with the model is probably the less that great base wood texture, the gain of the wood is far too big and looks blurry. The handles also don't look particularly look like real metal, but this might be able to be improved by modifying the specular maps. There are also several issues with the texture seams around the corners of the table, which thankfully don't look too bad from a distance. It should be noted that due to the nature of Last Solus, much of the game will be in the dark so a lot of these minor problems shouldn't really be noticed. Due to coursework deadlines for my other modules I sadly haven't had much of a chance to work on Last Solus. I realized today it had been over a month since my last 3D model so thought I'd work on something new before I get any rustier. As I knew I was a bit out of practice I decided to pick something small that will lie about in the background unnoticed. It's quite blocky as I made the mistake of not dividing the initial cylinder enough at the start, however, by the time I had noticed this I was already too far in to start again. For anybody interested the reference image I used can be found here. It's hard to see from this angle but the top of the telescope says "Caochladh" which means "death" and "change" in Scottish Gaelic. I doubt anybody would ever notice, I just think it's a nice touch. Quick wee sketch to try and convey the theme of regret and insanity that I want to feature in Last Solus. Today I finally submitted my research proposal for my dissertation and honours project. I am still unsure as to if what I have submitted is what the lecturer is looking for, but I at least learnt a great deal about my research area while writing it. I've attached the proposal below for anybody who wishes to read it. I decided to write the 5 minutes of gameplay in the form of a short story. Simply writing out the key story elements in the game design document is helpful but I feel it often causes the narrative to lose its character and atmosphere. This short story was written in an attempt convey tone and style in which the narrative should be told. A man lies on the floor, his head facing the sky. Rain pours down on him while rouge waves assault him from afar. As he opens his eyes they are met with a storm of dark clouds and the crashing sound of thunder. Lightning quickly ensues. His eyes follow the streak of light which blasts the lighthouse right next to him. He has no idea where he is or how he got here. Becoming aware of his situation he stands up and looks for cover from the cold rain. He groans with every step, every part of him aches. Looking in every direction he tries to see if there is anything that might help him understand where he is, but he finds nothing. The rain is so heavy he can barely see. He stumbles around the base of the lighthouse trying to figure out the direction to the mainland. Nothing but ocean expands in every direction, no land or boat in sight. The waves get stronger and panic starts to set in. He stands trying to process what’s happening. His shattered thoughts are interrupted as a wave almost knocks him over the edge, saved only by the rusty railing that borders the concrete base. He eventually realizes there is nowhere to go but inside. A deep sense of fear overwhelms him as he places his hand on the door, but he has no other choice. Shouting for help he opens the door, but the eerie nature of the place makes him question if he even wants a response. His eyes re-adjust from the rain and he sees a light switch next to the door. He presses it tentatively, praying it still works. Sparks of electricity can be heard as the room flickers with light and unveils its hidden horror. Splattered blood and chunks of flesh cover the room with a blood soaked knife lying loosely on the desk. He stands petrified - unable to move. Suddenly the door behind him slams shut and the lights start to flicker! Scampering and laughing can be heard above him as well as a deep rumbling earthquake like roar. Edging back he attempts to open the door, his wet hands shaking uncontrollably as he tries to wrap them round the handle. It’s locked. Suddenly the rain and freezing wind didn’t seem too bad. He slowly looks up to where the noise has come from, his whole body shaking now. Nothing but an empty spiral staircase. His panicky and shallow breathing echoes up the long empty shaft of the lighthouse dome. Startled by the reverberation of his own voice he tries to control his breathing, but it proves useless. As his eyes continue to scan the room he notices the place is filled with clothes, old cans of food and makeshift mattresses. People live here, or have lived here at some time. He sees a note on the counter with the blood soaked halfway through, but still legible. Inching towards the paper he picks it up and starts to read. He set down the note, so many questions rushing through his mind. He again turned his head up to the long spiral staircase. No noise had come from there for quite a while now. He was starting to even question if he ever actually heard anything. Maybe it was just a bird call or something, but what about the locked door? He edged towards the bottom of the staircase, his feet accidently hit a chunk of dead meat and he is once again reminded of the severity of his situation. It had been around 10 minutes since he had woken up outside in the cold rain, and while still terrified about what lies ahead, he could feel his fight or flight reactions kick in and a strong urge to survive. He starts ascending the spiral staircase taking care with every step while constantly scanning the room for threats. After the first few he starts to speed up and even feels a slight sliver of confidence. He is about a quarter of the way up the lighthouse when he hears a loud deafening banging at the bottom door. It catches him off guard and he jumps. He stands motionless trying to listen but the waves and rain muffle out any distinguishable sounds. One of the main pieces of feedback i got was that I should try experimenting with players perceptions more. My lecturer suggested the idea of teleporting the player to different places if the lighthouse was starting to feel too cramped. For some reason I had never thought of this. I think I was too focused on my idea of teleporting the whole lighthouse to different locations like the desert and the arctic, the idea of teleporting the player never really occurred to me. This could definitely be an interesting way of keeping the environments fresh and exciting. After mentioning a lack of books about horror in video games, one of my classmates recommended "Silent Hill: The Terror Engine" which I've had a quick look at and seems perfect for my research. My lecturer also suggested to research Mise-en-scene in horror (a term I had somehow never ran into during my research), watch American Movie and play Sailor's Dream. I plan to look at all these things over the next week. I've spent the past 2 weeks working on the basic shell of the lighthouse. While it still needs a lot of work I'm happy with how it is progressing and feel like I've managed to keep true to my original concept art. The majority of the modelling and uv mapping has been done with only the top quarter left to be finished. I don't feel I will be able to complete the lighthouse by my initial deadline of the 10th as I completely underestimated how much work modelling a lighthouse is. However this does not worry me too much as I feel the most difficult parts are behind me. After the lighthouse is done the only thing left is modelling objects which I am very confident in. The more I work on this project the more I regret choosing a lighthouse for my setting. While they look great and create a fantastic atmosphere, they are incredibly hard to design. Having circular rooms is difficult enough without have to also deal with spiral staircases and limited space. The increasingly narrowing shape of a lighthouse also makes creating modular wall assets almost impossible. That being said I have managed to finalize the design and have blocked out what I want to do in Maya. Now what I need to do is properly model it, which I think may be the hardest part of this whole project. At the moment I’d like to have the basic lighthouse model and texture by the 10th of November but I will have to wait and see how I get along. Here are some documents I used to help plan out the lighthouse. Since these plans I have removed the idea of multiple floors as the level was getting too cramped.